National Geographic Children's Books, 9781426327322, 160pp. From the first wheel to the International Space Station, the miracles of engineering are all around us. Think cars, bridges, skyscrapers, and yes – even bubble wrap! Engineers dream up new ideas and bring them to life while figuring out creative solutions to problems they encounter along the way. But how do they do it? Find out in Solve This! In this fun book, kids are confronted with wacky scenarios like this one: You're playing with your little sister when a vulture swoops down and grabs her favorite teddy bear. Mid-flight, the vulture realizes it doesn't care for the taste of fake fur and drops it to the ground. But now the plushie is on the other side of a raging river. How do you stop your sister from crying, stay safe, and save the day? 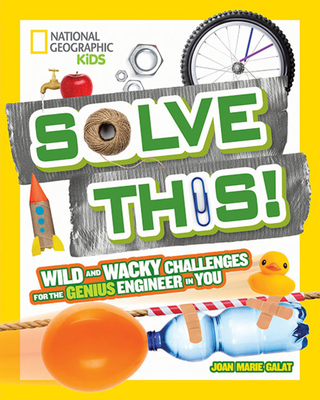 Each challenge invites kids to think creatively to problem solve. Then they can see how different National Geographic explorers tackled the challenge. One of the big lessons? There's often more than one solution! JOAN MARIE GALAT is the award-winning author of 11 books, including new titles in 2015 and 2016. Her books for children explore astronomy, ancient myths and legends, light pollution, history, and nature. Her first title, Dot to Dot in the Sky: Stories in the Stars, became a bestseller within six weeks of its release.